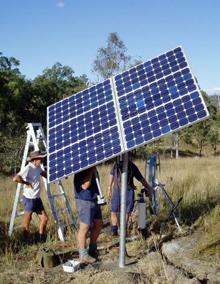 The Gundfos Solar Pumping System is specially designed for water supply in remote areas where no reliable electricity supply is available. 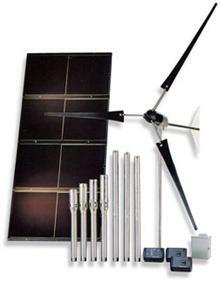 Whether the challenge is to install a complete new water supply system or replace an existing windmill, the SQFlex submersible pump is a flexible solution that can be powered by the sun using photovoltaic modules or a wind turbine. It can even be connected to a small AC generator to enable pumping to continue throughout the night to manage peak demands or during extended periods of inclement weather. For applications requiring less than 200 Watts of solar modules, the SQFlex 100 is an ideal choice and comes standard with the IO 100 switch box or the IO 101 with provision for AC input avaibable as an option. In higher flow applications where the power exceeds 200 Watts, the Grundfos SQFlex system is supplied standard with the IO 101 AC back-up switch box. Even more conveniently though, where stop/start operation based on water level in tanks or dams is required, both the SQFlex 100 and larger SQFlex systems can be automated by the addition of the CU 200 control box. The only moving part in the whole pump system is the submersible pump/motor unit, and the combination of stainless steel corrosion resistance with energy from the sun ensures great reliability. With dry running protection and simple installation, this pump is a dream to run and maintain.